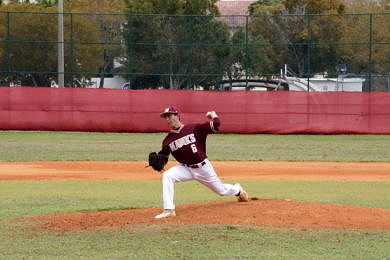 Hawks senior Erick Argote picked up the win after a strong six innings of work. Miami Springs’ undefeated season continued Monday, as the Hawks defeated Reagan 11-2 in the Coral Gables Spring Bash. It’s the second time Miami Springs has began a season 8-0 under Manager David Fanshawe, but the manager says he’s taking things one game at a time. “I don’t even look at that to be honest with you,” Fanshawe said. “I try to keep are kids humble when it comes to that stuff. It’s not something we pay too much attention to. The Golden Hawks received a great outing from their starter, Erick Argote. The senior left-hander had a strong six innings of work, and picked up the win. Despite the final score, the ball game was close throughout the middle innings. In the top of the second inning with the game still scoreless, The Bison got hits from Daniel Perez and Luis Rincon. After a sacrifice bunt by Victor Davilla, the designated hitter, Adam Navarrete, poked a single up the middle, that brought Perez and Rincon home to take an early 2-0 lead. The Hawks came back in the bottom of the 2nd and tallied a run of their own. 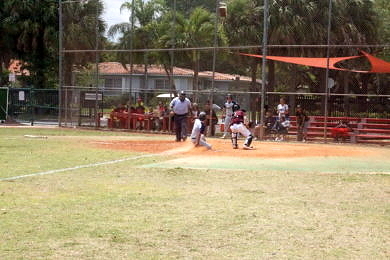 After a couple of walks, and bunt single, Miami Springs pushed a run across on a sacrifice fly to cut the lead to one. Miami Springs would pick up where they left off in the bottom of the 3rd. After loading the bases, Jason Torres singled to centerfield and brought home two runs to take the 3-2 lead. Bruce Yanez followed that with an RBI single. The Hawks would score one more run in the inning to take a three-run lead. The Hawks put up another crooked number in the bottom of the fifth. An RBI single by Lazaro Hernandez, and a two-run double by Yanez put the game away for Miami Springs. Yanez was 2-for-3 with three RBI on the day. “My goal is always just to put the ball in play, and help my team win,” Yanez said. That would be more than enough for Argote, as he and Brandon Villabrille kept the Bison bats quiet the rest of the way. The Bison fall to (4-6) on the season and look to bounce back against Hialeah tomorrow afternoon. As for Miami Springs, they look to continue their incredible run against the same Thoroughbreds on Wednesday.